The wind died wayyy down today as a big pacific front is rolling in up north. The lull in the wind met will a lull in the currents and swell. So I took my prediction and put the kayak on the water a mere 40 minutes after work. 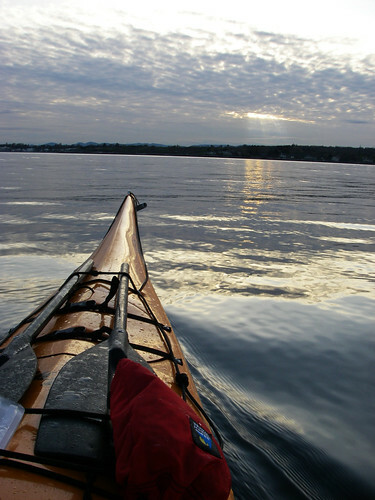 This is my first paddle during the week (and should become a regular occurrence now that it's staying light out later). Just before I got on the water I chatted with fellow coming off the water, who'd just been out to the Chains, and he said the water was very, very calm out in the channel. 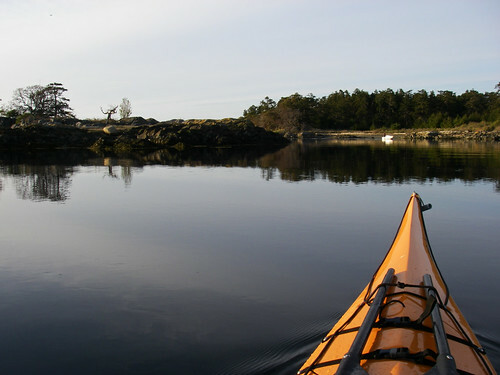 I loaded up the kayak and put in at the oak bay marina slime beach. 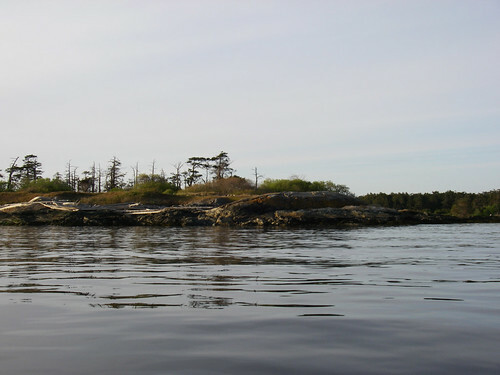 As I paddled around mary todd island, my jaw dropped - the ocean was a big glassy lake with visibility all the way to Port Angeles. 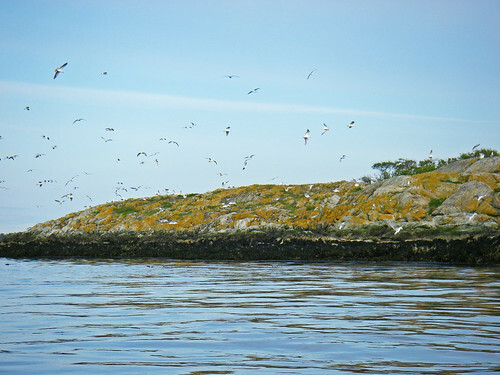 I went out to the chain islands and saw a huge flock of gulls circling the little rocks they called home. The water was so still that the eelgrass was standing right up from the sea floor and the kelp was bumping the bottom of the hull. I put my paddle on the deck and watched the birds for a while. A few GBHs skulked around the shallows and a small group of geese arrived on the scene. Suddenly, the island trembled as all of the seagulls squawked at once, as if in choir, and then jumped into the air, as if in choir :). I covered my head as well as I could and got the hell out of there. So I felt a little adventurous and decided just to go see what chatham island was all about. Man what a cool place. As I approached I nearly grounded myself in a little shallow patch but the little trickle of ebbing current swiftly took me away from the rocks. As I came up to the island, there were an incredible number of these disgustingly gnarled, windbown, gale ravaged trees. I was drawn further into the island out of curiosity instead of circumnavigating it. I'll save the outside shores for another day, I wanted to see those radio towers and the inner bay while I had enough light to get some photos. There was a bit of water confluence going on, you could feel the currents, but they were just flattening the water even further. 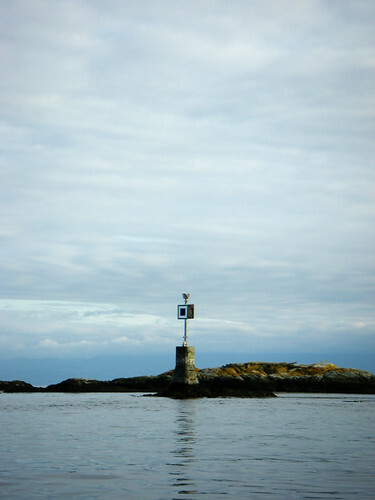 I waved to a native fisherman picking up the rest of his traps for the night and passed on toward Strongtide island. 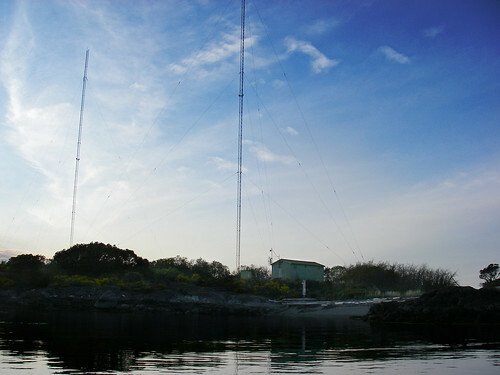 Just before I made it to strongtide with its admittedly wimp tide, I saw the broadcasting towers and made my way straight for them. I'm glad I got to see all this stuff and still have tons of light. It was a pleasant little paddle through Chatham, but I decided to just head back home before sunset. I didn't have enough lighting to be stuck in oak bay in the dark. It's amazing how much of this place you can see pretty easily at such dead slack current and wind. 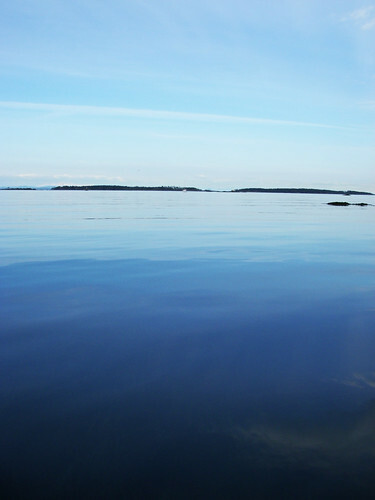 I cruised into oak bay at a nice leisurely pace and didn't need to enter any crazy eddy lines or anything like that. Ahead of me, the sun began to set in the clouds casting a fantastic jesus beam or two on the hills. An island visit and a great sunset — Nice way to wind down from work. I Definitely see this happening a lot more over summer - especially if I see that turn point in the current guide again.